Gallia Academy junior Abby Cremeans (2) slips through the IHS defense for a layup, in front of teammate Maddy Petro (left), during the Blue Angels’ 64-41 loss to Ironton on Thursday in Centenary, Ohio. CENTENARY, Ohio — One quarter can make, or break your entire evening. 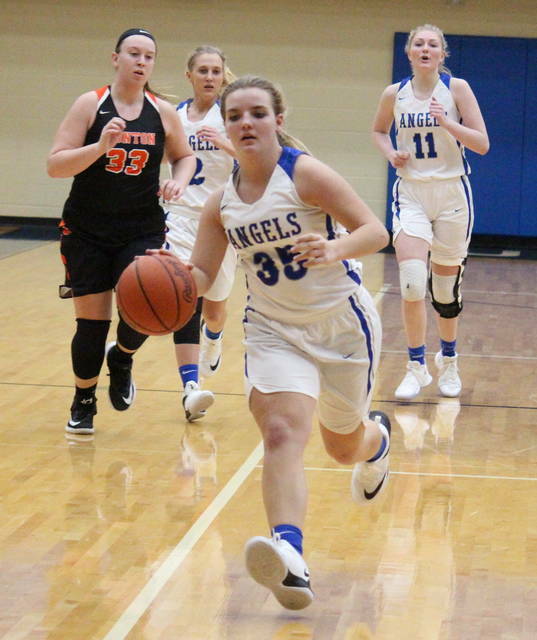 The Gallia Academy girls basketball team trailed Ohio Valley Conference guest Ironton by just five points at halftime on Thursday in Gallia County, but the Blue Angels were held off the board entirely in the third quarter, as the Lady Tigers surged to a 64-41 victory. After five lead changes early in the first quarter, Gallia Academy (4-1, 1-1 OVC) opened up its largest lead of the night, at 14-10, with 3:45 left in the period. However, Ironton (3-1, 2-1) ended the stanza with a 10-3 run and a 20-17 lead. GAHS tied the game with a trifecta in the opening 15 seconds of the second quarter, but the Lady Tigers scored 14 of the next 16 points and led 34-22 with 3:30 left in the half. Gallia Academy closed the period with a 9-2 run, making the IHS lead 36-31 headed into the break. 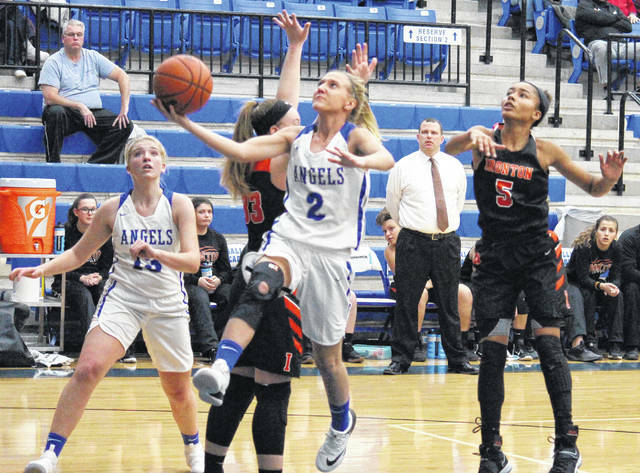 In the third quarter, Ironton extended its advantage to 52-31, scoring 16 points, while forcing the Blue Angels into eight turnovers and 11 missed shots. The Blue and White broke the cold spell with 7:23 left in regulation, as sophomore Alex Barnes stole the ball and made a break-away layup. The Orange and Black outscored their host by a 12-8 count after that, sealing the 64-41 triumph. “Mentally we have to get stronger, we were gassed,” fifth-year GAHS head coach Justice said. “The defensive adjustments we made at halftime were what we wanted to do, but when you just throw the ball around, committing turnover after turnover, you don’t really get to set up a defense. For the game, Gallia Academy shot 15-of-52 (28.8 percent) from the field, including 4-of-16 (25 percent) from three-point range. Meanwhile, Ironton was 26-of-52 (50 percent) from the field, including 3-of-14 (21.4 percent) from beyond the arc. From the charity stripe, GAHS was 7-of-10 (70 percent) and IHS was 9-of-12 (75 percent). Ironton won the rebounding battle by a 33-24 tally, with both teams grabbing 10 offensive boards. 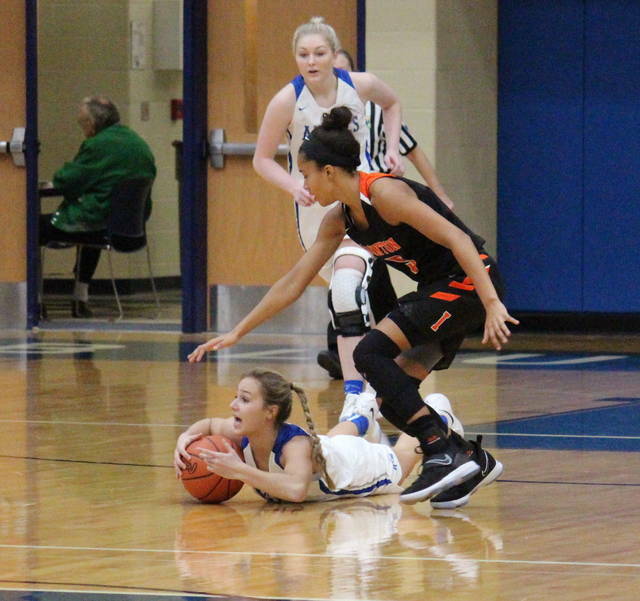 The Lady Tigers also held advantages of 16-to-9 in assists, 11-to-10 in steals and 5-to-1 in blocked shots. GAHS turned the ball over 16 times in total, while the Orange and Black gave the ball away 15 times. Barnes led the hosts with 19 points, 17 of which came in the opening half. Hunter Copley finished with seven markers, Ryelee Sipple added six points and a team-best seven rebounds, while Ashton Webb had four points and a team-high three assists. Abby Cremeans marked three points in the setback, while Maddy Petro scored two. Barnes and Copley also led the team on defense, recording three steals and one rejection respectively. Lexie Arden led the Lady Tigers with a double-double of 26 points and 14 rebounds. Wise also had a double-double for the guests, scoring 19 points and pulling in 10 boards. 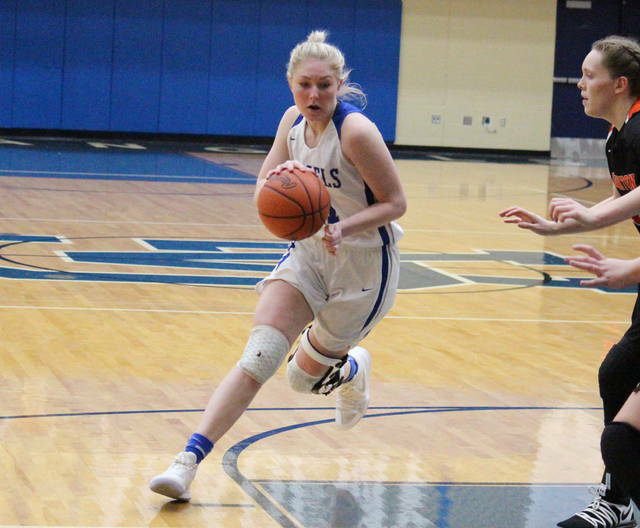 Katie Boyer scored six points, Riley Schreck added five, while Lilly Zornes and Kameren Arden scored four points apiece. Elli Williams recorded five assists for the Orange and Black, Wise came up with five steals, while Lexie Arden blocked two shots. Gallia Academy continues OVC play when Coal Grove visits Centenary on Monday. “It’s just going to be like with these guys,” Justice said of Monday’s matchup. “They have two really good players, we just have to find the shooters, know where they’re at, know our role and let the other ones go. The Lady Tigers and Blue Angels will meet again on Jan. 22 in Lawrence County.